If every author’s primary responsibility is to keep the reader turning the page while mumbling the mantra “just one more chapter . 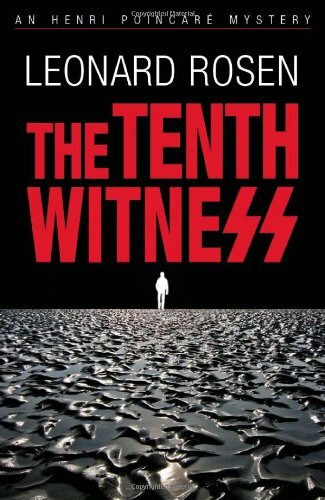 . . just one more chapter” then Leonard Rosen has more than accomplished this goal with The Tenth Witness. The story introduces protagonist Henri Poincaré as a retired Interpol agent who relives the event that brought him to the agency. In 1977 Henri, in his mid-twenties, and his then partner, Alec Chin, have just begun an engineering company and have been hired by Lloyds of London to salvage the HMS Lutine, a ship lost two centuries earlier, submerging millions in gold bars to the bottom of the North Sea. As Henri prepares for this project, he meets Liesel Kraus, just a few years older than he, but wealthy beyond description. The daughter of a German steel magnate now deceased who produced steel for Hitler’s regime, Leisel seems to be aware of her father’s relationship with Hitler, yet there is a sense of denial to her awareness. Liesel brings Henri into her family where he encounters a family with a dark history. Henri mentally and physically revisits his own family and soon learns of the death of a favorite family friend, Isaac, whom Henri has always referred to as Uncle. Within a short time, another death occurs under mysterious circumstances, that of Uncle Isaac’s friend from World War II. As the relationship with Leisel blossoms, Henri becomes aware of many troublesome events that occur within both the past and present of Leisel’s family and Henri soon encounters an uncanny three-degrees-of-separation between Leisel’s family and Uncle Isaac. Upon reading the biography of Leisel’s father, Otto Kraus, Henri learns of a cryptic letter signed by ten witnesses, attesting to the fine man’s credentials—a letter that saved Otto from prosecution as a war criminal. As Henri begins to dig deeper into Leisel’s family history, an unsettling awareness of things not being what they are presented to be surfaces and Henri learns the disconcerting truth about Leisel’s father and his relationship with a Nazi death camp and with Uncle Isaac. Mr. Rosen has developed a fine manner of presenting various events that don’t appear to be connected, and then drawing the lines between the dots until the vivid picture appears. Even the discovery of a Nazi submarine (an event that Mr. Rosen cleverly uses to foreshadow the family’s role in World War II) close to the Lutine takes on a major role in the story. Missing gold bars, Nazi submarines, sinister German expatriates in Argentina, a 200-year-old ship, a false biography, a museum dedicated to bringing Nazi’s to justice, old men, and young love—these are things that the story is made of. And it is a joy to watch how Mr. Rosen neatly weaves them together. Mr. Rosen paints a graphically clear picture of Nazi camps of the past and slave labor of the present and sews them together seamlessly. His characters are well developed with several surprises thrown in just to entertain the reader. If Henri Poincaré is soon going to make another appearance, it would behoove any reader who enjoys a good mystery to start collecting the rest of the titles in the series. You will not be disappointed.